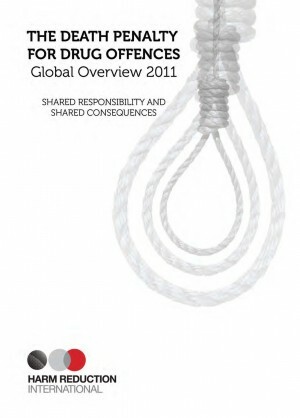 ‘Global Overview 2011 – Shared Responsibility and Shared Consequences’ is the fourth report on the death penalty for drug-related offences produced by Harm Reduction International. In addition to providing a survey of international developments related to capital drug laws around the world, it focuses on foreign nationals sentenced to death and/or executed for drug-related offences. The report demonstrates that every country in the world – whether it retains capital punishment or not – has a stake in the abolition of the death penalty. There are hundreds, if not thousands, of non-nationals who are facing or have faced the death penalty for drugs in recent years including citizens of Australia, France, Israel, Liberia, Mexico, Mongolia, The Netherlands, Nepal, Nigeria, Peru, The Philippines, Sweden, Turkey, United Kingdom, United States, Zambia and many more. No government in the world can be assured one of its own citizens will not be subject to sanctions that violate international human rights law. In fact, the report reveals that in many cases, foreigners appear to suffer death sentences at disproportionate rates. In some countries the majority, or even totality, of those executed are non-nationals of the prosecuting state. To download this report in full please click here.